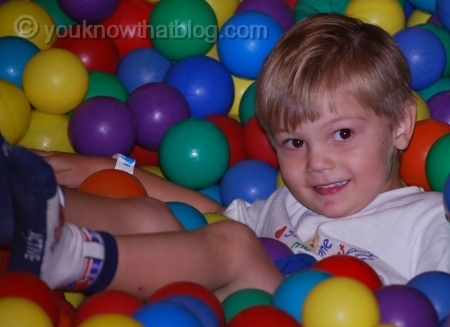 Stranger Danger « You know… that Blog? 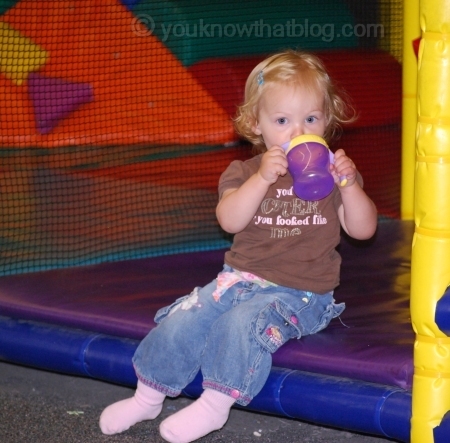 Today’s playdate with Doodle Cakes and ShaMoo started out well enough – we met at a new-to-us indoor playground because the weather was iffy at best, and our usual splash pad get together didn’t seem like such a good idea. Wasn’t so bad, not too many kids and ours all soon disappeared into the massive padded, netted, plastic ball and loopy slide laden structure of fun, except for ShaMoo’s Little Bit, who is still too teeny to toddle off. Cool beans. The amigos settled onto a bench to chat and watch. I took a few snaps. This is one half of “Frank & Frank” (reference: Timothy Goes to School), ShaMoo’s youngest of two sons. Call him “Frank2”. 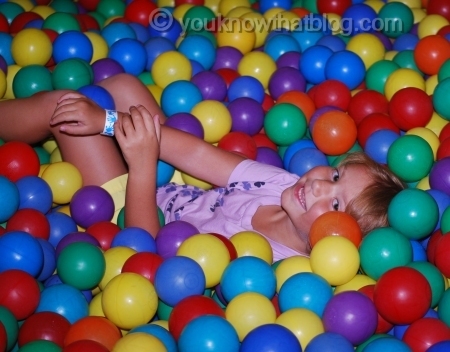 Wee One enjoying the ball pit. Around about this time, the place experienced a flood of kids, including some far too old to be allowed in a play structure. Little kids started getting mowed down, and ShaMoo suggested moving the smaller kids into the more protected toddler area. This is the part where I should have known better. I looked for Wee One to let her know we were going around the corner of the structure to another area, but she was having fun, deep inside the structure. I decided to move my things with DC and SM and then come back to find Wee One and let her know where we were sitting. I was gone from that bench for maybe 90 seconds, and just around the corner. I came around the corner on the outside of the play area to find the following. 1. 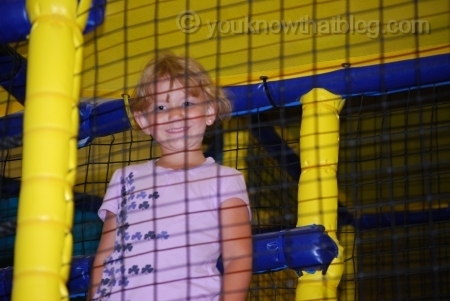 My 4 year old daughter, outside the gated, supposedly monitored play area. 3. My 4 year old daughter speaking to a strange man. Of course I blame myself for leaving that bench. Of course I should have waited until I could catch her eye and let her know we were moving around the corner. I know she’s a sensitive child, and easily frightened by strange situations. My thinking was that she was in a secure (I thought) area, and I wasn’t leaving – I was just moving. We have had talks all her life, from the time she could understand me, about staying safe and not talking to strangers. I was sure she would know what to do (or not do) if she felt lost, and that she knew I would never, could never leave her. Clearly I was wrong. She didn’t think, she just reacted. I grabbed her and brought her to where we were sitting, holding onto her tight. I refused to think of what might have happened. It was a long time before the tears stopped. Tonight at dinner, we had a little chat about what had happened, and what she did that she should never have done. I told her I was sorry for moving without telling her first, but that what she did wasn’t safe, and I explained to her why she should never have left the “safe” play area. She should have gone to the bench where we’d been sitting (she would have seen us as soon as she came near) and stayed there until I found her. Coming to find me was not a safe thing to do, even if it made sense to her then. Most of all, she should never have been with that strange man and talked to him the way she did. It’s hard to know how far to go when explaining dangers to a four year old child. Especially one that has been so timid her whole life, and doesn’t need anything else to be afraid of. I have to tread lightly where this baby girl of mine is concerned. Tonight I felt the need to scare her a little bit though. I needed to get through to her so she would know how I felt when I saw her doing those things, and how I would have felt if I had been 30 seconds longer and she really had gone off looking for me. I need her to know why talking to strangers is a bad idea, and what to say and do if a stranger wants to talk to her. I cannot begin to explain how freaked out I was that I could have lost my baby today. We were at a Chuck E. Cheese once when the girls were tiny. They were enjoying the ball room when this group of older teens showed up. Not only were they stinkin’ drunk, but they all went ahead to play with the little kids in the balls. Creepy, I’d say! .-= Melissa B.´s last blog ..Writer’s Workshop: Flying Solo =-. .-= cherie de castro´s last blog ..Friday Funnies =-. I know how you feel. My friend and I had our daughters (then about 4 & 5 years old) at the town park. My friend and I were sitting at the picnic tables where we could see everything and noticed our girls talking to an old man sitting on the bench. I really didn’t have a problem with that because at first, I just assumed he was a grandpa there with his kids. However, the conversation went on longer than we liked so my friend and I got up to go tell the girls to go play. It was then that the girls decided to come running to us – all HAPPY and excited. The river indeed runs adjacent to the park, but it’s down a very steep embankment and totally out of sight of anyone in the park. I flipped out. I told the girls to stay with my friend and we’d take them down to the river ourselves. I marched over to the old coot and gave him a piece of my mind…what is the MATTER with him inviting two little girls down to the RIVER, is he NUTS? and he just stuttered and said “Well I thought they’d like to see the water…” and I told him in no uncertain terms that it was completely inappropriate…. .-= Karen Rice´s last blog ..Hawley PA: Welcome to Woodledge Village =-. Holy smokes, Karen! That is terrifying. I would have called the cops on him right there and then. You never know! I’m 99% positive the man Wee One was talking to was “ok”, and just a dad with his kids, trying to calm her down, but that other 1% scares the crap out of me. WOW…scary. Glad it had a happy ended. Deep breath of relief. .-= JennyMac´s last blog ..You’re so busted, you don’t even know. =-. I once confronted a young man at our science museum, set to play with my then 4 year old girl while avoiding eye contact with me. So I started asking him a bunch of questions, and he was just hanging out there. She couldn’t figure out why I didn’t want her playing blocks with a man in his 20s with no kids there himself. Creepy, creepy stuff. So glad she was okie dokie. .-= Lisa Milton´s last blog ..grace =-.